Use our Aruba Vacation Packing List to relieve that big headache that packing for a vacation can bring. Packing to go on your Aruba vacation should be less of a headache considering you don't need to take much with you. Check "What To Wear In Aruba" on our All About Aruba page. You do not have to dress formal on the island of Aruba. You need casual clothing and beachwear, personal grooming items and a few miscellaneous items and you're set...oh, yes...don't forget your sun block! Of course, what you pack is your own individual choice. To make the task of packing for your vacation easier, I have comprised a free Aruba Vacation Packing List for you. 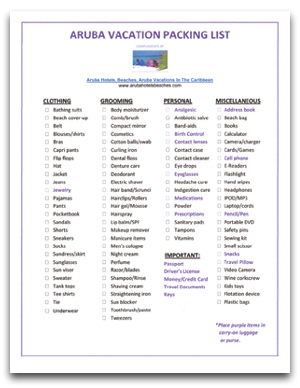 Simply print it out and check off items as you pack them...headache free! Click here to read the PDF in your browser, or right-click to download it. Click here to view our Aruba Activities page.